Laura Sanderson Healy, writer, reporter and friend describes a visit to LA's Museum of Jurassic Technology. Tourists in Los Angeles herd like mustangs to Hollywood Boulevard to stamp across the stars embedded in its “walk of fame” (“Rudolf Valentino looks very much alive / as he looks up ladies’ dresses as they sadly pass him by” – The Kinks’ Celluloid Heroes). Cinemas still show movies there in the restored American Picture Palaces the El Capitan, The Egyptian Theater and Grauman’s Chinese Theater (I Love Lucy featured its collection of movie actors’ foot and hand prints). Aside from the prowling mad and bad, there is the wax village of Madame Tussauds Hollywood and “Ripley’s Believe it or Not’s odditorium to tempt those who wish to part with their dollars. I have attended several fun film premieres with my family here. I have braved the day-to-day scrum of gawkers when I am of the mood to be hospitable to guests who wish to partake of this famous but people-choked strip. 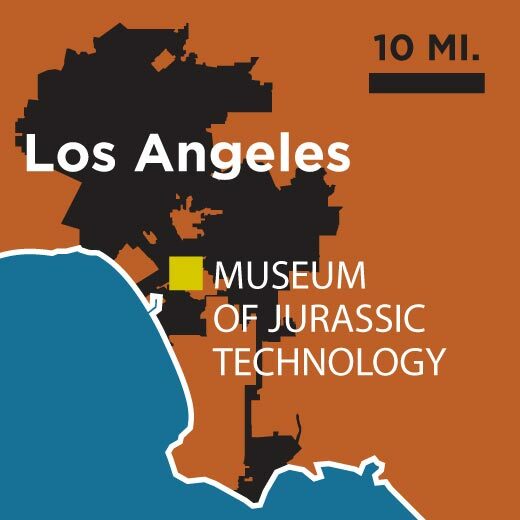 When a more discerning, curiousity-craving friend visited L.A. this spring, however, I led her by the magnifying glass to the Museum of Jurassic Technology, far from Hollywood in Culver City. Known officially as the “heart of screenland” (it’s on their recycling and garbage bins), Culver City is the locale where my most favorite comedies were produced – the Our Gang and Little Rascals films of the Hal Roach studio, the Marx Brothers’ A DAY AT THE RACES and A NIGHT AT THE OPERA on the M.G.M. lot that now houses Sony Pictures, and I Love Lucy at Desilu, now The Culver Studios. One can look at a grain of rice that is carved and decorated to resemble Pope John Paul II, or learn what “halcyon days” refers to, with an exhibit of kingfishers’ eggs. The dark rooms feature all manner of projection and lighting and audio displays that highlights oodles of information about the strangest things. It is a temple to the weird, and there is a library within where one can study why Mayans had that sacrifice thing going or why animals can be so fascinating. The museum is right next to the famous hamburger eatery “In-N-Out” and near the reborn Culver City pedestrian district where arts and restaurants make it a veritable toytown to those who want to have fun.